LONDON - Benadryl, the allergy-relief medication brand owned by Johnson & Johnson, is embarking on its biggest integrated marketing campaign to date in an attempt to position itself as an information hub for allergy sufferers. The campaign, created by JWT, retains the brand's 'War on allergies' theme launched last spring. It is based on the concept of sufferers being under attack from pollen and other allergens. The activity is designed to engender loyalty in the category, which is dominated by BOGOF promotions. As well as TV work, the latest phase of the campaign includes online banner ads and social media. The digital activity is intended to drive visitors to a new consumer website intended to demonstrate that Benadryl understands the needs of allergy sufferers and offering resources to help them fight the problem. The heavy use of online work is a break from the norm, as hayfever and allergy-relief brands have previously tended to push spend into TV. Benadryl is also hoping to benefit from the fact that most allergy information and advice available online is unbranded. 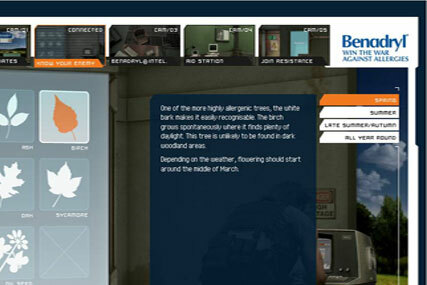 The site has been designed on the theme of a resistance fighters' bunker, with video clips of military-style characters guiding users through the information. A section entitled 'Air raid updates' allows users to enter their postcode to get up-to-date information on the pollen count in their area. Other sections include 'Know your enemy', which provides information on specific allergens and how to avoid them, and 'Join the resistance', which allows users to sign up for daily pollen alerts or for an iPhone app offering real-time updates. Digital agency Red Box provided support on the technical production of the website. Benadryl is the number-one hayfever-remedy brand in the UK by value sales and value share, according to IRI data for the year to 24 April 2010.